This cross-over album is sheer fun. 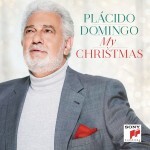 It pairs the great bari-tenor Plácido Domingo with Christmas favourites, Christmas innovation, and such artists as Vincent Niclo, The Piano Guys, Helene Fischer, young artists from Los Angeles Opera, Jackie Evancho, Hayley Westenra, Plácido Domingo Jr, Banda El Recodo – and the much-mispronounced (by John Travolta) Idina Menzel. If that seems like a lot, it is. Stylistically, it ranges over a very wide terrain. From simple evocations of “Hark! The Herald Angels Sing” to a mariachi version of “Feliz Navidad”, this album has a Christmas touch for every Christmas taste. The only audible link connecting each part to every other is the great Domingo himself. Everything else is singular, playing by its own rules, and finding its own voice and audience. One work will stand out among others, for a sheer novelty one rarely finds anywhere. “Guardian Angels”, sung by Domingo and Idina Menzel (okay, Adele Dazeem) was written by Gerda Beilenson and – get ready – Harpo Marx. The famous harpist originally composed it as a solo piece for his instrument and a 1945 War Bond rally. Lyricist Beilenson later came along and added words. Then, it was picked up by Mario Lanza and Mahalia Jackson. Now? It has become a charmer given new life by Domingo and friends. Not a bad way to live again, at this or any other time of year.